1. An ultra-deep nail polish has left that dreaded tawny stain on your nails, which refuses to go away despite repeated swipes of the polish remover? Dip a lemon wedge in baking soda to scrub your fingers squeaky clean. 2. ‘Tis the season for red lips but maintaining them all through the night is a pain. Make it easier by rubbing a bit of cherry Jell-O powder directly onto moistened lips before applying your lipstick. For maximum precision, apply with a Q-tip or clean lip bush – you really don’t want a red ring around the mouth! Even when the lipstick begins to fade, your bold lips will appear to be intact for hours due to your Jell-O primed pout. 3. Have unmanageably curly hair? Skip the generic towel and use a simple cotton tee to dry your strands after a shower. A bath towel actually increases frizziness by roughing up the hair cuticles, while a smooth cotton knit fabric soaks in excess water without disturbing the natural ringlets. 4. Any face moisturiser can do double duty as a makeup remover in a pinch. Simply pour onto a ball of cotton and wipe across the face to remove makeup, then rinse off with warm water. Or, apply on a Q-tip and use with a light hand to clean up smudged liner and flaky mascara. 5. Cold sores? Ultra-dry lips? 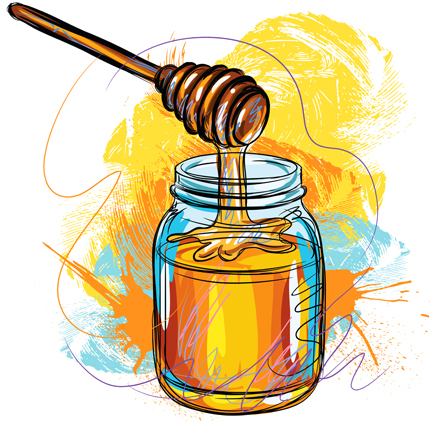 Dab on a little bit of honey – it is excellent for repairing dry and cracked skin, while simultaneously warding off bacteria. Have you tried any of these tricks-of-the-trade? What are your secret beauty fixes that work wonders? I love this blog. I have a variety of hankies (about $1 each) that I keep on hand for hair drying. Works great!